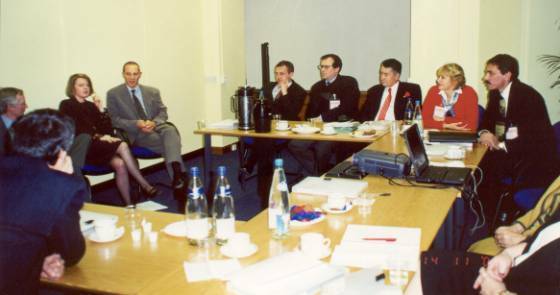 The Center for Interethnic Cooperation (CIEC) and the English Non-Government Organization Responding to Conflict (RTC) have a common project dedicated to the acquaintance with work experience of state organs in Great Britain concerning assistance to interracial and interethnic understanding in the society. 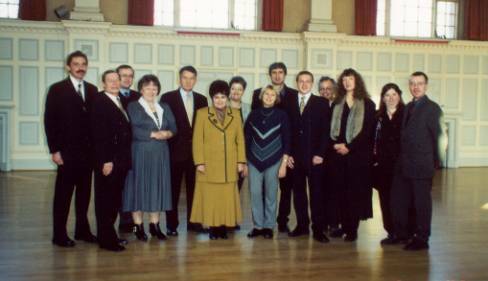 In the scope of this project, on the 13th of November 2000 our delegation left for London. The delegation was composed of leaders of five Russian regions (Moscow, St Petersburg, Nizhny Novgorod, Rostov-on-Don and Krasnodar) being responsible for the work with national communities in their regions. 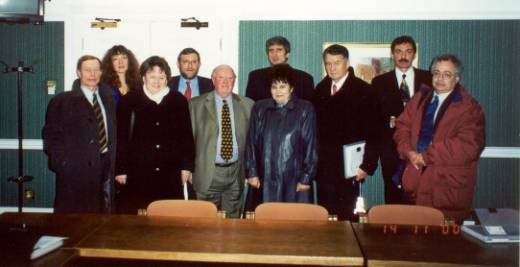 Abrar Yarlykapov, the vice-chairman of the Committee of Social and Interregional Affairs, and Tat�yana D�yakova from the Moscow City Duma represented Moscow in the delegation. The participants of the delegation from the other regions were: Ol�ga Savinova, vice-gubernator of the Nizhny Novgorod Oblast� (region) and director of the Department of Public Affairs; Anatloij Maksimchuk, chairman of the Department of Work with Public Organization and Mass Media of the Apparatus of Plenipotentiary of the president of the Russian Federation (RF) in the South Federal District; Andrej Vetrov, chairmen of the Department of Public Affairs of the St Petersburg Administration; Ekaterina Ivanchenko, chairman of the Department of International Relations of the Office of Information and Social-Political Prognosis Making of the Administration of the Krasnodar Krai (county); Aleksej Eremin, vice-chairman of the Department of Foreign Affairs of the Mayor�s Office of Krasnodar. In addition, Sergej Podgorbunskij, the chairman of the Department of Interaction with Mass Media and Public Affairs of the Ministry of Affairs of Federation, National and Immigration Policy, traveled with us to England. The purpose of the visit was the acquaintance with work experience of English state organs. We had meetings at Scotland Yard, the Ministry of Interior, the Parliament of Great Britain, the Mayor�s Office in London, the Prefectures of Camden and Newham, the Commission of Racial Equality (Such a commission exists! ), the Mayor of Birmingham, England�s second largest town of England, the headquarters of the famous television transmitter BBC, etc. As a result, subdivisions, having the task to assist interracial equality in the society, exist now factually in all authority structures of Great Britain. In particular, every higher enumerated state organization, where we had meetings, has such a subdivision. In addition, the Ministry of Interior has not only such a subdivision, but even one mission of the Ministry is the ensuring of juridical protection of racial and ethnic groups. The full name of this Ministry is not accidentally Ministry of Interior and Tolerance, and the mentioned subdivision is named Union of Racial Equality. It is interesting that Scotland Yard (the official name is Capital Police) has also a department working in the sphere of interracial relations. Whereas analogical subdivisions of the GUVD (Main Administration of Inner Affairs) in Moscow struggle with criminal ethnic groupings, Scotland Yard has completely different tasks. The special mission of this subdivision is the protection of ethnic groups. It is named Department on the Fight Against Racial Crime. Apart from the central office of Scotland Yard in the local police stations in all 32 districts of London exist groups of officers specialized in work with the racial and ethnic communities in their district. Of such a type are our �uchastkovie� (policemen responsible for only one district) with the only difference that they work not with all inhabitants of the district, but only with representatives of minorities. These officials pass through special trainings. They make visits in families to find common solutions for problems concerning the police�s work. One of the most important missions of the given Departments is the containment of racist propaganda or acts infringing the rights of ethnic and racial minorities. For this purpose a specialized information center and a council has been established. In the council are among others also representatives of racial and ethnic minorities. Worth mentioning that the Ministry of Interior and Tolerance demands of all state institutions to have among their personal at least 10 % representatives of ethnic minorities. And in addition, in Great Britain exists a Commission on Racial Equality financed by the government, but works independently of authority structures. This Commission monitors that there were no discriminations on racist background in governmental institutions and private firms. In particular, a special subdivision of the Commission checks all complaints preferred by racial and ethnic minorities. Necessary mentioning that the biggest success of Scotland Yard, the Ministry of Interior and Tolerance, the Commission on Racial Equality and other organizations working in the sphere of interracial understanding is that representatives of minorities began to address considerable more with their complaints on curtailments of their rights to state institutions. As a result, these people started to trust more in the government, and understood that the government can protect them. 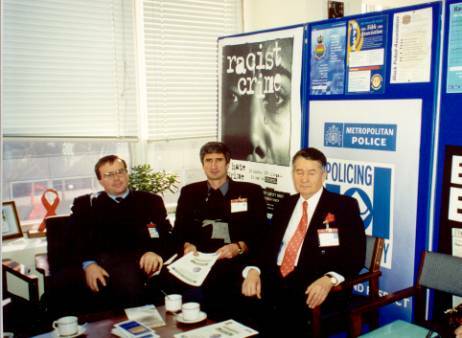 When people in general people phone the Hotline of the Moscow GUVD (which has been launched on order of the capital�s mayor Jurij Luzhkov) because of illegal acts of the capital police, than the Commission on Racial Equality rather checks complaints on refusal of engagement because of racial origin. The following is interesting: if the Commission defines that a complaint is not simply a subjective opinion of the representative of the racial minority, then it puts pressure on the given firm to employ the person or to pay a compensation for the moral detriment. In about 80 per cent of the problems are solved in this way. Only in 20 % of the cases the Commission has to address to the court. We spent 5 days in Great Britain. Everybody of us had television in his/her hotel room. Thus we could convince ourselves that the British channels neither show war nor horror movies. Or trip was very rich; we had 3-4 meetings a day. Each meeting lasted 2-3 hours and was very rich concerning information and impressions. That is we did not go to London to take a rest, but to work. And we worked very intensively.� However, �igra stoila svech� what means that the stake paid for us. The common opinion of the members of the delegation was that the trip was very interesting and useful. Of course, an automatically application of the British experience to Russia is not expedient. But it is necessary to study the international experience in order to set up effective mechanisms for the promotion of international understanding in our country. I think that the members of the delegation will for still quite a while analyze the information seen and heard in Great Britain, and that they could use this information for their everyday work.